1878-1880s autograph album that belonged to John Franklin Wadsworth, "Frank", who was born in Maine and reared in Massachusetts. The album contains autographs from two areas, the Holliston, Massachusetts, area, and the Fall River, Massachusetts area. Many of the signers indicated they were in the Class of 1879, some if not all at Holliston High School. 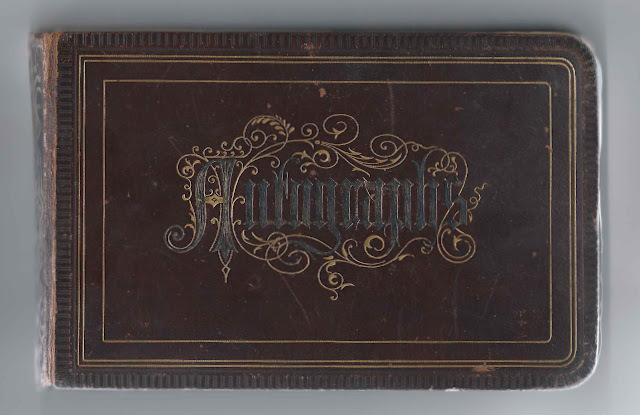 See another post that features an autograph album kept by John Franklin Wadsworth from 1875 to 1877, with signers from the Somerville, Massachusetts area; the Holliston, Massachusetts area; and the Fall River, Massachusetts area. 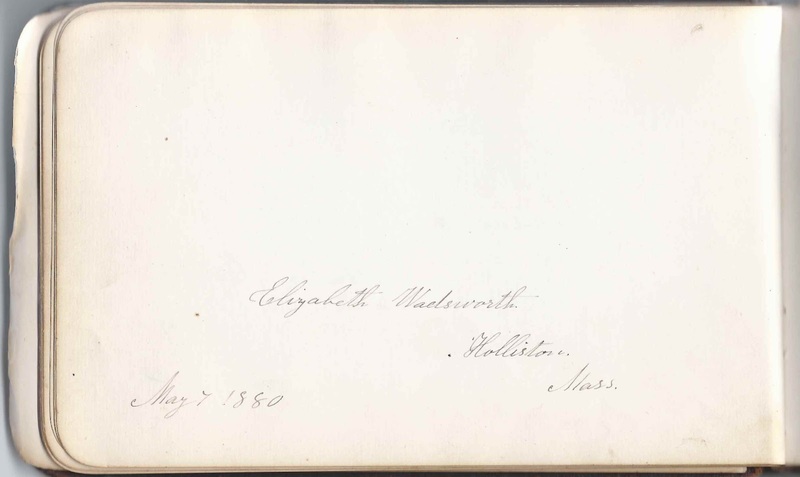 And yet another post features the 1880s autograph album of Frank's sister Ella M. Wadsworth, or Mary Ella Wadsworth, as her Maine birth record indicates. As noted on the ownership page below, the album was apparently a Christmas gift. The album is approximately 7-3/4" x 5" and contains the sentiments of 116 of Frank's relatives, schoolmates and friends. An alphabetical surname list and an alphabetical list of signers, complete with any family relationship, school affiliation or residence information, appears at the end of this post. John Franklin Wadsworth was born 15 May 1862 at New Sharon, Maine, the son of John and Elizabeth (Leonard) Wadsworth, who were born in Maine and Massachusetts respectively. 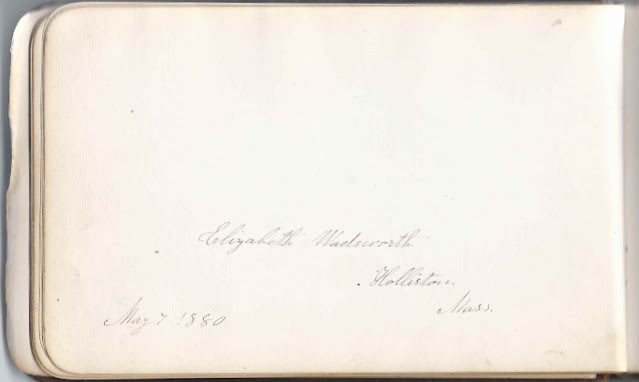 The Elizabeth Wadsworth who signed at page at Holliston, Massachusetts, on May 7, 1880, was presumably Frank's mother Elizabeth (Leonard) Wadsworth. Frank's father John Wadsworth did not sign a page in this album but he did sign a page, with his wife Elizabeth (Leonard) Wadsworth in the album of Frank's sister Ella M. Wadsworth. You can see the similarity in Elizabeth's handwriting. Four of Frank's siblings signed pages in his album. An earlier John had died the year of his birth. There also may have been a Frederick who did not survive to adulthood. Brother Charles T. Wadsworth, who was born 23 December 1855 at Braintree, Massachusetts, signed a page at Holliston, Massachusetts, on May 7, 1880 and wrote "Colby '83" in one corner, presumably Colby College at Waterville, Maine. 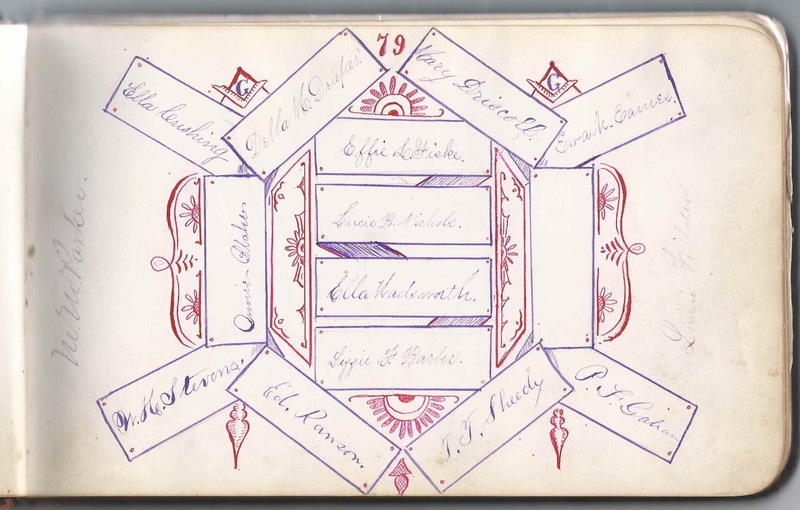 He had also signed a page in Frank's earlier album at Fall River, Massachusetts, on June 13, 1875. 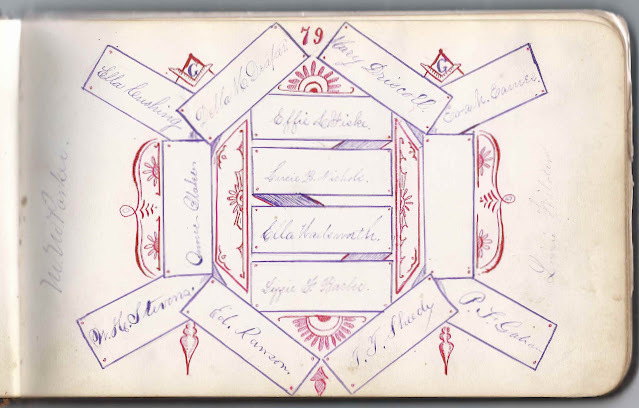 Brother George Melvin Wadsworth, who was born 4 April 1857 at South Weymouth, Massachusetts, signed a page, also on May 7, 1880 at Holliston, Massachusetts. George's future wife, Elsie L. Warfield, also signed a page. Brother Arthur Leonard Wadsworth, born 4 January 1864 at New Sharon, Maine, signed a page, also on May 7, 1880, at Holliston, Massachusetts. 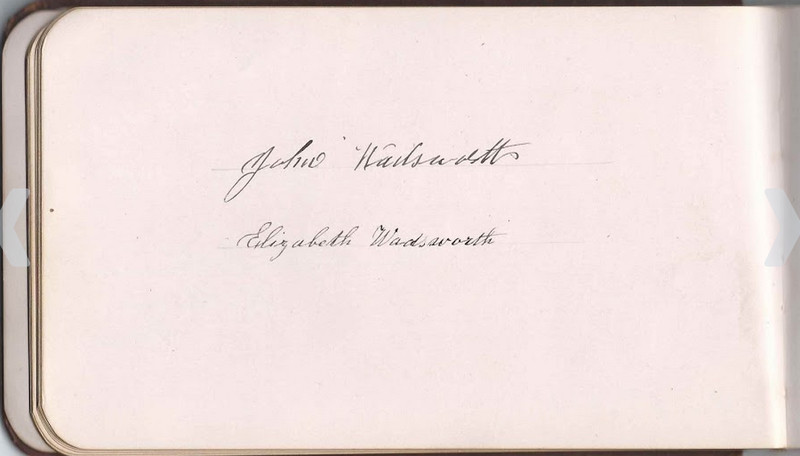 Frank's sister Ella M. Wadsworth, or Mary Ella Wadsworth, signed a page on February 4, with no year written, and mentioned that she was in the Class of 1879; she also signed on a page shared with 14 other students in the Class of 1879. Signers on the group page above: 1) Ella Cushing; 2) Della M. Draper; 3) Mary Driscoll; 4) Eva M. Eames; 5) Effie L. Fiske; 6) Lucy B. Nichols; 7) Ella Wadsworth; 8) Lizzie F. Barber; 9) Annie Blake; 10) W. H. Stevens; 11) Ed. Rawson; 12) T. T. Sheedy; 13) P. F. Gahan; 14) M. M. Parker [One or both M could be a W]; 15) Lizzie Wilder. Lizzie F. Barber of Holliston, Massachusetts, signed on February 13, 1879; "Class of 1879"
Mela I. Barrows of Middletown, Connecticut, signed on September 22, 1879; presumably Mela Isabel Barrows. 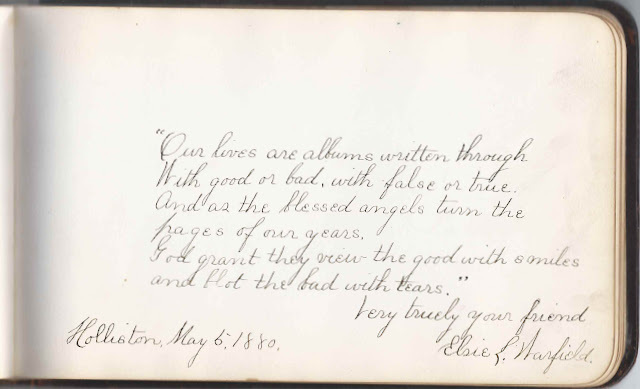 She signed on September 30, 1879 in the album of Mary Ella Wadsworth, sister of John Franklin Wadsworth as Mela Barrows Bennett, reflecting her recent marriage to Alfred A. Bennett. Surname is Booth; first initial might be F.
Lottie A. Bragg of Braggville, Massachusetts, signed on February 19, 1879. Braggville was located in or near Holliston, Massachusetts. Aaron C. Bragg of Braggville, Massachusetts, signed on May 16, 1879. Braggville is in or near Holliston, Massachusetts. Daniel A. Clark; his wife Mary Smith (Bliss) Clark shared the page. M. S. Clark of Pawtucket, Rhode Island, signed on October 31, 1879. She was Mary Smith (Bliss) Clark, whose husband Daniel A. Clark shared the page. James Coles of Holliston, Massachusetts; signed at High School on May 14, 1879; intricate sketch of bird and scroll in colors of black, red and blue. Addie L. Conger of Holliston, Massachusetts, signed on "3-8-1880"
Ella Cushing, signed at Holliston, Massachusetts, on February 20, 1879; "Class of '79"
Louise A. Cushing, signed at Holliston, Massachusetts, on March 9, 1880. "Dark Night Mar. 3rd"
Idella M. Draper, signed at Holliston, Massachusetts, on February 7, 1879. "Class of '79"
Mary E. Driscoll, signed at Holliston, Massachusetts, on March 11, 1879; "Class of '79"
Eva M. Eames of Holliston, Massachusetts, signed on March 1, 1879. "Class of '79"
W. H. Evans of Holyoke, Massachusetts, signed on October 12, 1879. Marion A. Freeman of Holliston, Massachusetts, signed on October 10, 1879. She was Marion A. (Olcott) Freeman, whose husband Daniel W. Freeman signed the left facing page. Their daughter Bertha A. O. Freeman also signed a page. Eliza M. Hillis of Fall River, Massachusetts. 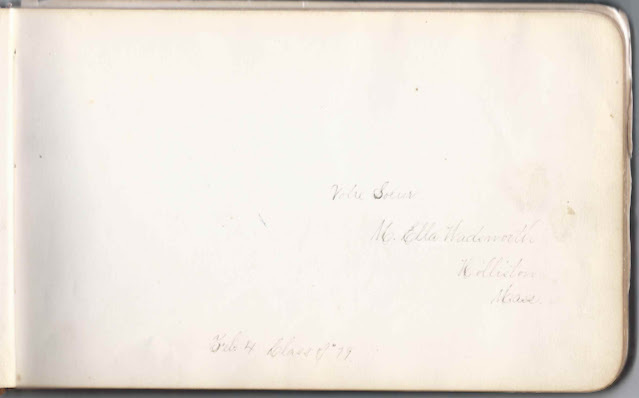 "Remember the visit to Warren, R.I. March 26, 1881"
Clara A. Lowd of Holliston, Massachusetts. She was Clara A. (Stuart) Lowd, whose husband Albert Leavitt Lowd signed the right facing page. Albert Leavitt Lowd of Holliston, Massachusetts; his wife, Clara A. (Stuart) Lowd signed the left facing page. Lucie Nichols of Holliston, Massachusetts, signed on March 7, 1879. "Class of '79"
R. A. Nightingale of Fall River, Massachusetts, signed on April 12, 1881. Perhaps Robert A. Nightingale, born 9 November 1855 in England, son of John and Elizabeth H. (Ferriman) Nightingale; died 11 July 1912 at Fall River, Massachusetts. He wrote a musical notation. Sarah A. Power of Fall River, Massachusetts, signed on April 5, 1888; not sure of middle initial - could be S or ?
? Pratt. Can't make out initials. Edward C. Rawson of Holliston, Massachusetts, signed on March 12, 1879 "Class"
M. T. Reeves of Fall River, Massachusetts, signed on November 2, 1879. Perhaps Milton T. Reeves, born about 1865, son of Mark and Elizabeth Reeves. Sadly, Milton T. Reeves died on 13 June 1880 at Fall River, Massachusetts. H. H. Sager of Pawtucket, Rhode Island, signed on October 31, 1879. Presumably Henry H. Sager. Thomas F. Sheedy of Holliston, Massachusetts, signed on March 15, 1879. "Class of 79"
Warren H. Stevens of Braggville, Massachusetts, signed on March 13, 1879 "Class", H.H.S., presumably Holliston High School at Holliston, Massachusetts. Braggville was located in or near Holliston. 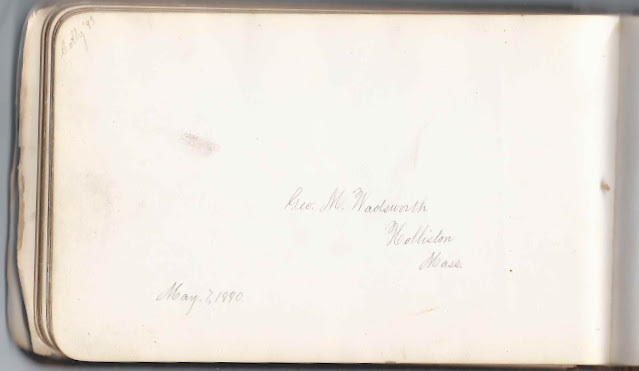 M. Ella Wadsworth of Holliston, Massachusetts, signed on February 4, Class of 1879; "Votre Soeur" John Franklin Wadsworth's sister Mary Ella Wadsworth. George M. Wadsworth of Holliston, Massachusetts, signed on May 7, 1880. 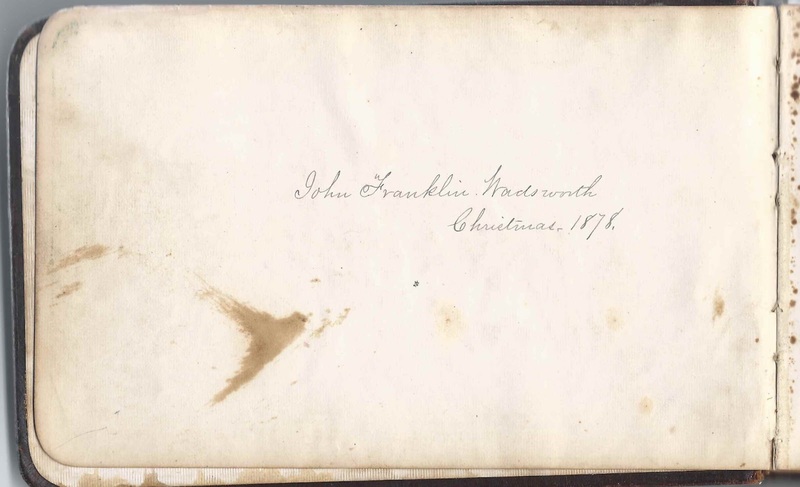 Album owner John Franklin Wadsworth's brother. 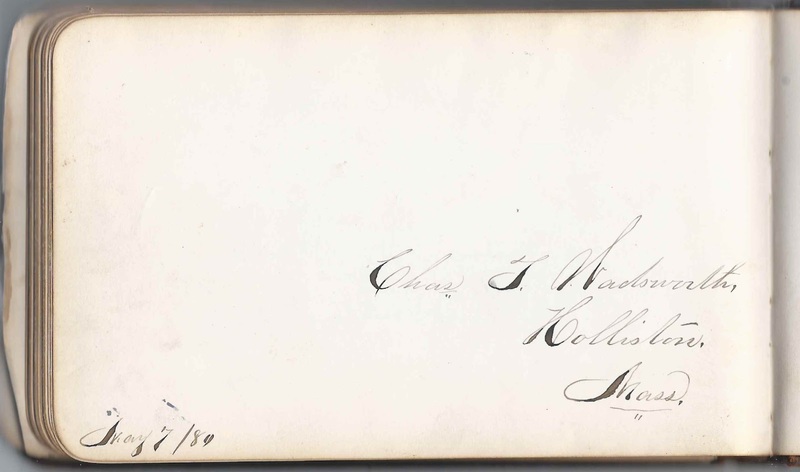 Charles T. Wadsworth of Holliston, Massachusetts, signed on May 7, 1880. Album owner John Franklin Wadsworth's brother. He wrote "Colby '83" in a corner. Mr. and Mrs. J. W. Williams of Fall River, Massachusetts, signed on "9.2/80"
How exciting! I'm researching John "Frank" Wadsworth and his wife Charlotte Childs - that's quite a treasure you've found. I can't thank you enough for sharing it here with us! Glad you happened upon it!